California’s “Hayden Law”, enacted in 1998, extended the mandatory holding period for shelter animals from 72 hours to four to six business days. It encouraged shelters to work proactively to place animals and reduce euthanasia rates. The provisions of the Hayden law have been loosely adhered to over the past decade and a half, and this has resulted in great improvements in shelter practices in the State of California. Because this extended hold is a statewide mandate, the state must reimburse local shelters for their costs. California is just plain flat broke, and for the past few years hasn’t had the money to reimburse shelters the $23 million dollars per year it owes them under Hayden. But besides just plain not having the money to fund this mandate, another problems is the fact that the state reimbursement is only paid to shelters for animals who are ultimately killed. Those animals reclaimed by their owners, sent to rescues or placed for adoption must have their impound expenses paid for by the agencies or individuals who take them from the shelter, and not by the state. Shelters may not be as proactive as necessary because they will, in theory at least, receive reimbursement for animals that are killed. Laws with good intention often come with unintended consequences, and the Hayden law is no exception, as it has served as a disincentive for adoption. Most shelters currently hold dogs and cats much longer than the prescribed four to six days anyhow, and even if the Hayden law is repealed in whole or in part, shelters would most certainly not be REQUIRED to kill in three days. They can continue with their current best practices and techniques. Adoptions and numbers of pets sent out to rescues are at an all-time high. No one wants to kill, we hear from the shelters. Los Angeles County holds animals for an average of eleven days, and the City of Los Angeles holds them for an average of nine days. Well beyond any state legal requirement. Since there has been no state reimbursement since 2009, there will be no real substantive change in conditions with a repeal of the reimbursement mandate. The law will just be altered to reflect the reality of the state’s inability to fund local shelters. Besides, there are plenty of other action, progressive actions, that could be taken to reduce the burden on animal shelters. • Raise the limit on the number of dogs someone can own. Why is "3" a magic number – especially if they’re small? • Stop raiding places where the dogs are fine. Stop confiscating dogs from kennels where the dogs aren’t sick, in danger, or dying. Then there wouldn’t BE so many in the shelters. OH – and if there’s NO ROOM at the shelter, then don’t confiscate what you can’t take care of! • Start doing a better job of identifying what breed the animals in shelters belong to - THEN maybe they’ll be placed in appropriate rescue groups, or sold to people who will know what to expect when it comes to behavior – and the boomerang effect will be broken. • How about lowering the price of shelter dogs and dog licenses – so people can AFFORD to own one. • Stop the 2-tiered fee scam which requires a higher license fee for intact animals. Most of the owned dogs and cats in our state have already been castrated anyhow. But there is absolutely NO EVIDENCE that intact owned animals are any more a burden on society than sterilized ones. • Stray or feral animals are the ones who are problematic, but they don’t have OWNERS to sterilize them. 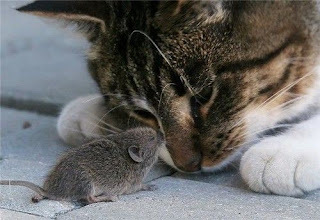 Feral cats comprise the majority of intakes and deaths. Trap-neuter and release of feral cats is a proven solution that few animal control departments use. I guess it’s easier to continue to blame animal owners for all the animals out there who don’t have owners. • Stop the exaggerations about the numbers of dogs that are pure-bred. Many shelter workers have personally told me, and I’ve seen it, that there are VERY few. The ads/promos make it sound like the shelter has ALL the breeds, just come and get one. People go looking for a pure-bred – and they’re not there. There are many excellent reasons for purebreds – including some idea of personality, size, and behavior – not to mention benefits of specific breeds for people with allergies. • Provide incentives for apartment owners to allow pets. • Picked up a stray with a license or a valid microchip? Give it a free ride home. Stop charging up the ying-yang with outrageous impound fees so high that people can’t afford to bail their pet out. • Stop the mass importation of stray dogs from Mexico, Taiwan, the Caribbean, Spain, Brazil, etc. Shelters and rescues import thousands every year. • Make the shelters report legitimate numbers – and NOT count the dogs multiple times, NOT count those who are Dead On Arrival, and NOT count the ones brought in at the end of their lives for a merciful death. • Take the funds that encourage illegal aliens to take up residence and live in comfort and distribute them to the shelter system instead. • Stop making it more profitable for the shelters to kill than to rescue. Hey – make them WORK with rescue groups. • Stop the unionization of the shelter workers. No union will EVER agree to a reduction in their work force or anything that might affect their job security. 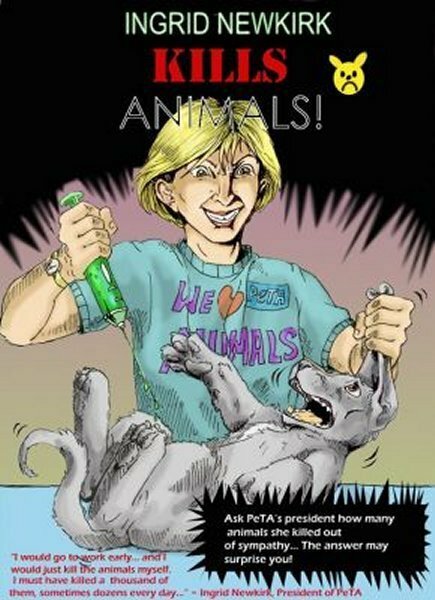 • FINALLY – HSUS, PETA and other sham organizations could give some of their ill-gotten SCAM monies to our shelters. • Just STOP making laws that make it more difficult and more expensive for people to own a pet. Our legislators should be able to come up with many more ideas – that are NOT onerous to pet-owners, that encourage people to have pets, and that would shrink the shelter population. We've heard the claptrap from the animal rights groups about how "every responsible breeder is a puppy miller, every family farmer is factory farmer, and every responsible hunter is a poacher." That's right! You are responsible for your animal. You are responsible to care for him, to protect him from suffering, and to nurture him. The law also regards you as responsible for the actions of your animal. If your animal is roaming at large and causing problems, again, you are going to be the one who must make restitution, and pay any fees or fines. When it comes to pets, we are a nation of responsible owners. According to the latest pet population survey for 2011-2012, There are 164.6 million owned dogs and cats in the US. And further, 39% of all households own at least one dog, and 33% of all households own at least one cat. That's a lot of responsible owners! But wait! You say. Not everyone is responsible. Some people discard their pets. Some people neglect or abuse them. What about THOSE people? I am responsible, but others may not be as ethical or conscientious an owner as I am, right? Sure, there are always a few bad apples in the barrel....people who intentionally abuse or neglect their animals. I believe those folks to be a distinct minority. And, as it turns out, judging by animal shelter statistics, they are only about 2% of all pet owners in the US. About 6-8 million animals sift through shelters every year; many are unowned feral cats, and about 20% are repeat customers (offenders?). About 10% are dead when picked up (going by California statistics). Considerably less than half are from a bad ownership situation. But calculated out, and figuring on the high end of 4 million per year, this means that only about 2% of all animals that are owned, will end up in a shelter in a given year. And some of those are taken there specifically for humane, end-of-life euthanasia. Consider further that many animals enter shelters not due to "irresponsibilty" but due to social problems like loss of a job or home foreclosure, or incapacity/death of the owner. So no sense trying to point the finger of blame at those situations. Life happens. We pick ourselves up, dust ourselves off and learn from our experiences. That is, after all, the responsible course of action, and it is the natural self-evolution we all undergo as we progress through this life. 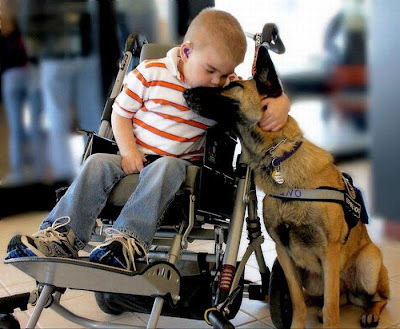 We as humans love our animals. We as Americans are responsible animal owners. It's as simple as that. "Dog show: Canine 1 percenters only"
For those who know the world of dog competitions mainly through the 2000 comedy film “Best in Show,’’ it’s all too easy to dismiss the humans in this world as obsessive fussbudgets who’ve lost track of the bigger picture. The Westminster Kennel Club Dog Show surely hasn’t dispelled that image with its decision to part ways with its former sponsor, Pedigree, over the pet food brand’s ads urging viewers to adopt shelter dogs. Those Pedigree ads were powerful, featuring noble-looking canines and a somber voice-over urging viewers to adopt shelter dogs, not pity them. This was too much of a downer for the kennel club. “Show me an ad with a dog with a smile,’’ a kennel club spokesman told the Associated Press. “Don’t try to shame me.’’ Sure enough, the ads on this week’s broadcast, from competitor Purina, have been far more upbeat. The kennel club is free to accept whichever sponsors it chooses. But a dog show - one billed, no less, as a celebration of dogs - is the best possible forum to urge the adoption of shelter animals. Instead, the kennel club’s stance only highlights the disconnect between the plight of millions of mutts and the bizarrely cosseted existence of canine 1 percenters. RE “DOG show: Canine 1 percenters only’’ (Editorial, Feb. 15): The Globe mocks those who enjoy showing their dogs as a hobby, yet remains stone silent on the hypocrisy of the animal rights groups, whose shelter ads only serve to inflame public ill will toward dog show participants. That “somber voice-over’’ in the Pedigree commercial belongs to David Duchovny, an animal rights extremist and supporter of People for the Ethical Treatment of Animals. PETA attempted to interrupt this year’s Westminster dog show with with a stage-grabbing protest, like a similar protest two years ago. Thankfully, they were held back this time by security. The American Humane Association, a co-sponsor of the Pedigree adoption drive, is also a fanatical anti-breeding animal rights organization. We are fed up with so-called animal rights groups. PETA euthanizes dogs by the thousands at their Virginia “shelter”, as do other animal rights groups through their promotion of anti-animal ownership legislation. Breeders, on the other hand, do not suffer from any “disconnect’’ from shelter animals. We rescue and re-home thousands of dogs every year through breed rescue efforts. We support the Canine Health Foundation, which helps improve the lives of all dogs, whether purebred or mixed breed. Who are the animal rights groups to dare lecture the rest of us on how “unlucky’’ shelter dogs are, compared to the dogs who have the spotlight? Animal rights groups should not be allowed advertising spots to heap scorn and derision on dog hobbyists. IT’S DISINGENUOUS for letter writer Geneva Coats to criticize those who must perform the thankless, heartbreaking task of euthanizing homeless and suffering animals when the purebred dog-breeding industry she supports directly contributes to the need to do so ( “Breeders aren’t the problem; PETA is the problem,’’ Letters, Feb. 23). very minute. Their lives depend on being adopted, yet breeders continue to churn out litters of puppies, in hopes of making profits or winning ribbons. Every time someone buys an animal from a breeder, a dog or cat in a shelter loses her chance at a home and will pay with her life. tragically short of good homes and work to promote spaying, neutering, and adoption instead. The hypocrites at PETA kills adoptable animals by the thousands at their Virginia "shelter". They have a horrific 97% kill rate. This is a matter of public record. Meanwhile, other shelters in the US, who actually do care about animals, have made great strides in reducing their intake and euthanasia rates. According to Maddie's Fund, we are on target to reach a nationwide "no kill" level by 2015. Pet overpopulation is a myth. The overwhelming majority of our nation's pets are sterilized, and we now face an acute shortage of pets in many areas. Many shelters, particularly in the New England states, import dogs from other areas and even from other countries. Hundreds of thousands of dogs are brought in from Taiwan, Romania, Mexico and the Caribbean. In November, 41 "rescued" dogs were shipped into Los Angeles from Spain. Massachusetts shelters have imported street dogs from Puerto Rico for many years now. In July of 2004, six people had to receive rabies treatments after a Massachusetts shelter imported a rabies-infected Puerto Rican street dog. Nationwide statistics show that there are almost six homes available for every animal that is killed in a shelter. Shelters who kill adoptable animals do so by choice. Don't be fooled by PETA propaganda. PETA kills animals. Their sadistic, misanthropist philosophy is the antithesis of "ethical". No Kill – We’re Almost There Already! A Different Perspective on "Rescue"
I started doing what is now called “rescue” in 1981. Not because I set out to save the world one dog at a time but because I was taught it is what you do for your breed. We didn’t call it by the dramatic name of “rescue”. We called it “helping out”, “doing what is right for the breed”, rehoming. There was no need to run around squawking about what a “horrible situation” the dog had been “rescued” from – just take the dog and find the dog a new home. Proclaiming loudly about “abusers” and “hoarders” to raise funds wasn’t done. We found the money and did for the dog. Even as a kid I knew that life is what happens while we are making plans and sometimes bad things happen even to good people. I think we are all aware there are the Vick type monsters out there but I really believe enough in the goodness of mankind that I believe Vick types are the exception NOT the rule. Just my opinion, I guess but also my hope for mankind. The first dog I took in was a sheltie found by my vet in bad shape, wandering a small town, grazing from dumpsters and handouts. Her nails were too long, her coat matted and she had stiches in her belly that my vet felt indicated a c-section, possibly involving a spay. We assumed that she had been in some kind of breeding facility and maybe dumped after her usefulness was ended. We checked to see if she was simply an escapee but no one claimed her. My vet and I, cleaned her up, vetted her, cut her nails and found her a new home. She showed no signs of “abuse”, just some neglect and some of that could have occurred while on her wanderings. I placed her with a young family who had a farm and she lived out the rest of her life as a very happy farm dog not even taking very long to adapt so you have to wonder. I tried at the time to get my club involved in setting up some kind of program to deal with rehoming but they weren’t interested. They just told me that the “good breeders” would take theirs back and anything else wasn’t their problem. Fortunately things have changed greatly since then and that club had an active “rescue” program the last time I checked. I have stayed quietly involved with “rescue” from the sidelines ever since that first dog, mostly just holding a dog for a few days, transporting or picking up a dog for a rescue, passing on information, educating new owners, doing some home visits and evaluating dogs. Small things that I felt I could help with but not going full bore into “rescue”. I don’t go around bragging about what I do because I feel it is what I owe my breed, not something I accomplish. I also don’t put down the owners of dogs coming into rescue FOR ANY REASON. First of all, I don’t know the whole story of that person’s life. I only see part of it. There are a lot of reasons in this world that someone’s life changes and frequently giving up a dog is a part of it. It may be a very difficult part but still necessary, and sometimes it is the best thing for the dog as well as the owner. I had to give up my dogs when my husband got sued years ago. I had no choice. It was feed my kids or feed the dogs. It was rough, especially when my son had to give up his golden because we were moving into an apartment that wouldn’t take a large dog. The apartment was all we could afford at the time. I was lucky enough to have the resources to place my dogs myself. Not many people do. The golden went to my boss and a year later saved his 5 year old daughter’s life. Needless to say, that dog had a good life with that family. 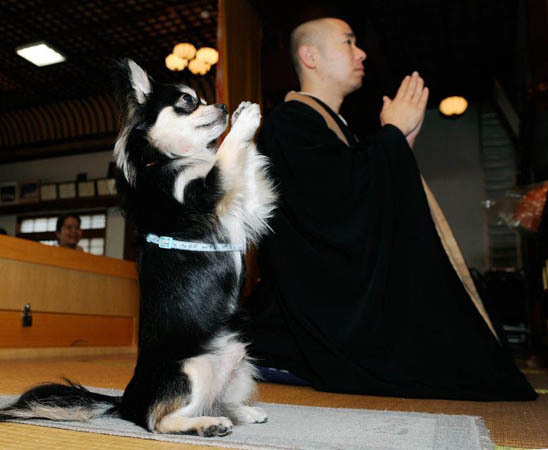 I cried a few tears and thanked God that the dog was in the right place. To me that is what “rehoming” is about – the right place for the dog. Not “glory” for me as a hero for “rescue”, not shame for someone who gives up or loses their dog for whatever reason. It’s about God given compassion for the dog and God given charity for the owners. Because every time I see some story about dogs taken from an “abuser” or a “hoarder” I know that with the political climate what it is today thanks to the animal “rights” extremists – there but for the Grace of God, go I. There are too many whackos out there that believe that keeping dogs as DOGS is abuse and that no human is good enough to own a dog. And there are too many “rescuers” who feed into that mind set with their screaming pleas for help and money for the dogs that have been “rescued” from some abuser or hoarder. I am always happy to do what is right for my breed and help in any way I can with the placement of a dog but I won’t do it at the expense of a human being. And when a “rescue” starts squealing about “hoarders” and “abusers”, I simply step away. It’s not necessary to denigrate another human being in order to help a dog. Just do what is right for the dog and let God take care of the rest. This article originally appeared in The Fancy Speaks column in the February 10, 2012 issue of Dog News. It is reprinted here by permission of the author. I read the January 20, 2012 DOG NEWS editorial “Regulating The Sale Of Puppies Online” with concern. Although it’s clear that the editorial is well-intentioned, it comes dangerously close to embracing the PUPS bill which is now in Congress. And PUPS, H.R. 835/S. 707, would be very harmful for hobby dog breeders. I would like to point out that people have been selling dogs by means of newspaper classified ads, magazine ads, billboard notices, and other forms of commerce and advertising for generations. No one has been regulating these retail sales directly to the public. The thinking has always been that the buyer needs to be careful when buying anything, from anyone. Caveat emptor has a very real meaning when it comes to buying a pet. The buyer should exercise due caution when buying a puppy or dog, whether they are buying from a magazine, newspaper, or over the Internet. It is not the responsibility of the government to regulate the sale of puppies for the buyer. It is up to the buyer to use some good judgment when making a purchase. This hasn’t changed since people were buying puppies from ads in dog magazines in the 1980s, or buying dogs at any other time in history. Large commercial breeders who are inspected by the USDA are already regulated and they do report their wholesale sales. However, the retail sale of puppies and dogs directly to individual buyers has never been regulated at the federal level. In many states this kind of sale is now regulated at the state level, if you sell more than x number of puppies per year. In some states it is covered under a sales and use tax, the same kind of tax that covers the sale of Girl Scout Cookies or having a yard sale. If you sell more than a certain number of puppies per year in some states you would be required to get a business and/or kennel license so you could regularly report your tax income from sales. HSUS calls the fact that retail sales to individuals are not regulated at the federal level a “loophole” and, in PUPS, they are trying to change this situation. But this exemption of retail sales for small breeders is not a loophole. It is the way the law was intended to work. In DDAL vs. Veneman (2003), the case in which the Doris Day Animal League sued the USDA to try to make them inspect retail breeders (home, hobby, show breeders), the judge gave a clear ruling that small breeders were not the same as pet stores and did not have to be regulated or inspected as such. HSUS has been trying to change the law through PAWS and PUPS ever since that time. These small hobby breeders and others who sell puppies and dogs by retail means were not meant to be regulated in the same manner as large commercial breeders. But that’s what PUPS would do. It is up to the buyer, not to the government, to check out the person who sells a puppy. Otherwise, all of us who breed dogs are going to have the USDA visiting our homes to see how we keep and raise our puppies. Now, it’s true, as the editorial mentions, that many people don’t like the idea of “regulation,” but in this case regulation cuts right to the core of everyone who breeds and shows dogs. If PUPS becomes law it would cripple breeders who show, breed dogs for performance, and who breed quality companion dogs. We would be required to meet the same USDA standards that are in place for large commercial breeders, even though we raise puppies in our homes. Most of us could not do this and the result would be the end of countless serious breeding programs in the show world, along with the end of precious bloodlines and, in some cases, the end of breeds. “The AKC does not oppose the concept of regulating high volume breeder retailers but we believe that the definitions proposed in this bill are misleading, overly broad, and potentially damaging to responsible breeders who individually maintain and breed only a few dogs in their homes. In short, AKC opposes PUPS as it is written and asked members of Congress to withhold their support. As it is written, PUPS would also regulate anyone who sells these puppies by any means, not just over the Internet. It specifically includes anyone who “sells or offers for sale, via any means of conveyance (including the Internet, telephone, or newspaper),” so it does not just intend to regulate people who sell over the Internet. I doubt I have to mention how many show breeders have web sites or sell puppies online. You would also fall under this bill for Internet regulation of puppy sales. for most home breeders to follow. order to meet federal standards. judgment based on breed and purpose. rescue dogs of their choosing. (APHIS) and overextends their enforcement ability. Adds more federal oversight and regulation into Americans’ daily lives. 1. 2.5 million animals are killed in shelters every year. 4. The number of animals killed in shelters has dropped by over 70% over the past 30 years. 5. 70-80% of animals in shelters are sterilized adults brought in for behavioral problems. Puppies are rare, as are purebreds. It is an owner retention problem, not an overbreeding problem. 6. 87% of pet dogs are spayed/neutered, as are 91.5% of cats – without oppressive laws. 7. Over 300,000 dogs are imported into this country every year from third world countries. 9. There is a shortage of pets in many areas of the country – rescue groups and shelters are transporting dogs to fill the demand. 10. 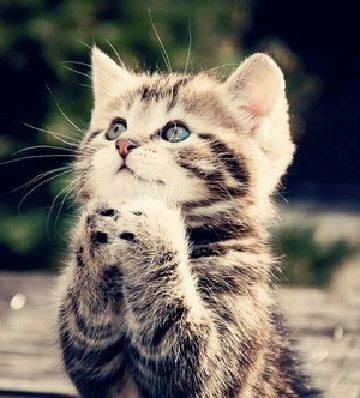 Myth: 1 cat can produce 420,000 cats in 7 years. Reality: 1 cat can produce about 3200 kittens over 12 years. Similar numbers exist for the myth that 1 dog can produce 67,000 in 6 years. 11. Spaying and neutering, especially at an early age, leads to shortened lives and many health complications, including bone cancer, prostate cancer, and many other deadly diseases. 12. Mixed breeds are not healthier than purebreds. Of 532 genetic diseases, mixed breeds carry 220. Of purebred dogs, the Poodle ranks highest with 145. 13. Spends less than 1% of its income on helping animals. 14. Does not own or operate any shelters in the U.S.
15. Is under investigation by the IRS regarding its “charitable” status. 16. Uses emotional, misleading videos of caged pets to initiate donations. 17. Uses the money from the millions donated to lobbying for incrementally restrictive laws designed to end pet ownership, agriculture, zoos and any other relationship between humans and animals.18. Includes many former employees of PeTA, including Wayne Pacelle. 20. Mandatory spay/neuter has been a failure wherever it has been imposed. More animals die, licensing and rabies vaccinations decrease, and costs rise. 21. Breed specific legislation has been a failure wherever it has been imposed. No breed is inherently dangerous and breed identification is difficult, making it unconstitutionally vague. 22. Pit bulls rank in the high 80’s in temperament testing, surpassing Golden Retrievers. 23. Dog bites are very rare, averaging 16 deaths per year (for the past 100 years), compared to 43,730 from cars, 14,400 from falls, 200 from plane crashes and 50 from being struck by lightning. 24. Seemingly innocuous laws (such as the PUPS bill) sponsored by animal rights groups such as HSUS are designed to incrementally make pet ownership more difficult, and eventually, impossible. A new law being proposed by Hawaii will make the sale of pets illegal in that state. "Maverick" a rescued Weimaraner, to participate in this year's Westminster Kennel Club show! The Westminster Kennel Club Dog Show spotlights the creme de la creme of the dog world. And in a curious twist of fate, the world of canine rescue is also a hot topic of discussion at this year's show. In one of the most heartwarming stories ever, we learn of a Weimaraner named Maverick. Maverick's owner purchased him from Craigslist a couple of years ago. Seems Maverick was in very poor condition, underweight, neglected and unhealthy. But within a few months, under the tender loving care of his new owner, Maverick began to go to dog shows....and win...and win big....and as a Grand Champion, he will now be a participant in Westminster, the most prestigious show of the year. Maverick's owner feels that his dog was a “rescue”. Indeed, Maverick could well have ended up in a shelter or rescue had he not been sold on Craigslist. Had that happened, Maverick would almost certainly have been neutered. What a pity that would have been for the Weimaraner world. I've often thought that the requirement to spay/neuter every rescued dog was not only unnecessary, and potentially detrimental to health, but also contributes to narrowing of breed gene pools. Canine geneticists advise us to keep as many individuals as possible in a breed's gene pool. Genetic diversity is necessary to maintain overall health, vigor, longevity, fertility and optimal immune system function. In the case of purebreds, spay/neuter of all rescues is a very unwise move that reduces genetic diversity. While of course we must be discriminating in selecting individuals for breeding, considering health and good temperament, it's also a beneficial goal to include as many individuals in breeding programs as possible to help promote diversity and avoid the pitfalls of inbreeding. Another benefit of genetic diversity is lower incidence of breed-specific genetic health problems. Wholescale spay/neuter, along with over-use for breeding of just a few dogs deemed exceptional, dangerously narrows the gene pools of our breeds. Maverick’s story is a success story not only for him and for his owner, but for his future generations. They would never be born if the typical “rescue” ending of a routinely performed neuter had spelled the end of Maverick’s tale. Thankfully, Maverick’s genes were ultimately preserved. Animal rights groups have convinced us that it is merciful to spay and neuter all the animals that pass through a shelter or rescue situation. They imply that breeding is a cruel fate for animals. I think they are wrong. Dogs enjoy the activity of raising their young, just as we do. And speaking of animal rights groups and Westminster, we also learned this past week of the termination of the Pedigree “Dogs Rule” advertising/adoption campaign that has been held during the Westminster KC show for the past several years. In my case, there was an immediate visceral objection to seeing presented abused and neglected rescued dogs (very few of which were intentionally-bred purebreds) at an event of this nature. Animal rights groups do believe that purebred dog breeding is to blame for shelter intakes and they make no bones about voicing that opinion. Even the narrator of the Pedigree commercials, David Duchovny, is an “animal rights” proponent and a PETA supporter. So, way back in 2007, I was curious about the Pedigree campaign which was jointly conducted with the American Humane Association. They support AR agenda legislation in various states. They advocate for mandatory, pre-pubescent spay-neuter. They oppose medical research using animals. They promote various “freedoms” for farm animals. They oppose commercial, for-profit breeding, slurring this as “puppy mills”, and state that this is inherently cruel. They support “guardianship” as opposed to “ownership”. They oppose any and all tail docking, ear cropping, debarking or declawing. They oppose racing and coursing. The AHA was surely laughing at us, because they were successful in perpetuating the image of show dogs as the source of shelter intakes. And they did it at the biggest kennel club event of the year! And the dog breeders actually CHEERED for them! I found it curious that during the Pedigree drive and fundraiser conducted during the Westminster KC show in 2007, there was never any mention of the many breed rescue groups, run primarily by breeders and breed club volunteers. I did not pay much attention to the commercials in subsequent years, so I don’t know if breed rescue ever was mentioned. The Pedigree commercials referred to AKC show dogs as “lucky”….saying shelter dogs are “not as lucky as the show dogs you see here”. The implication was that these show dogs are the few, the minority, that most dogs end up at shelters. Not true. A very small percentage of dogs end up at animal shelters each year….check the nationwide numbers, it is around 3-4% of owned dogs. The vast majority of dogs in the US are cared for in a responsible and humane manner, and do not end up abandoned. Sometimes, I think it is too easy to forget that, especially for those who work day-to-day in a stressful shelter or rescue setting. It’s not a result of “luck” that the vast majority of dogs lead a good life. It is the result of plenty of hard work, effort and dedication on the part of their owners. But mostly, it's the result of our love affair with our dogs. Westminster is a quintessential display of that affection we hold for "man's best friend". Responsible ownership and breeding is constantly under attack from AR groups. Good riddance to the Pedigree commercials at Westminster. The City of Chula Vista, California, recently established a task force to attempt to develop ways to reduce shelter intakes. (See “Senseless in San Diego” on this blog to be brought up to speed on the situation in Chula Vista). The task force is composed of rescuers, breeders and city employees. Sharon Hamolsky, a self-proclaimed “animal advocate”, recently brought a powerpoint presentation to the City, called “Ranger’s Proposal.” The proposal is named after her dog “Ranger.” Ms. Hamolsky holds a B.A. in religion (biblical studies) and she is a licensed pilot. No credentials in animal husbandry, however. Imagine that! “We have to weed out unscrupulous breeders who put profit before humane care for pets. We have to put unscrupulous breeders out-of-business….All prospective pet owners want a healthy animal”, the presentation begins. OK, so far so good. We are all for humane care for pets, most of us agree that the unscrupulous should be put out of business. And, a healthy animal is always a good thing, particularly when looking for a pet. "Ranger's Proposal will ensure prospective pet owners will be buying a quality puppy or kitten that meets very high standards.” Hamolsky states. Great! Maybe they are coming up with a plan to reduce the numbers of puppies smuggled in from Mexico? Fabulous! We can have guarantees for health and well-being! Let’s see the rest of the proposal to know how this miraculous feat will be accomplished. First, we are told that breeders must pay for a special breeder’s license, and pay to be listed on a special Licensed Breeder website, and pay to be included in a 1-800 U-verify phone line for breeders. OK, so far I’m not seeing how this proposal will ensure health and well-being of the pet. It looks like the money is going to go to city bureaucrats, not for veterinary care, or to buy food or new toys. Hmmm. Next, Hamolsky explains that breeder licensing is a requirement in the City of Los Angeles. However, she neglects to mention that LA’s breeder licensing and mandatory spay-neuter laws have been an abject failure. The cost for a breeder’s permit is $235 per year, and must be paid for any intact dog, whether or not the dog is ever bred. There is a four-page application for said permit, and I’d be surprised if any have applications have been submitted to date. Shelter numbers and deaths have risen sharply in Los Angeles under the brunt of these new fees, rules and regulations. Still not seeing how any of this promotes health and well-being of our pets. It’s all about extorting money. Next, Ms. Hamolsky presents a list of “approved breeder criteria” which she claims is approved by Bill Bruce, the very successful director of Calgary, Alberta’s animal control department. Mr. Bruce is a strong proponent of licensing for both dogs and cats. However, the purpose of the licensing is to facilitate returning lost pets to their owners. Licensed pets are even given a free ride home. Mr. Bruce has stated in public seminars that as long as the owner licenses, he doesn’t care how many pets they have or what they do with them. So I am rather skeptical of Ms. Hamolsky’s claim that Bill Bruce approved her list of criteria for inclusion on the licensed breeder website. That would be rather out of character for him. • Veterinary recommendations must be entered into a log book, with dates of compliance, and this book must be available for inspection 24/7. • Must pay city business license fees, state and local taxes and state sales taxes. Whether or not any of this promotes health and well-being of the pet is highly debatable. It definitely would serve to bloat the government coffers, and beef up the veterinarians' paychecks. Hey, City Councilmember Rudy Ramirez’s sister is a veterinarian! Now I think we can understand the impetus for these ideas. Lastly, Ms. Hamolsky suggests launching an ad campaign featuring male stars and athletes to promote sterilization of male dogs. WAIT a minute! What does neutering have to do with promoting health and well-being of pets? There are few genuine medical conditions that require neutering, and many health problems that can occur as a result of neutering. And what does a public ad campaign for neutering have to do with breeder licensing? All in all, this is a very schizophrenic proposal, and will only serve to eliminate local sources of healthy, well-bred pets. Breeding dogs is generally a money-losing proposition, and heaping more fees, permits, inspections and other hassles on those who breed an occasional litter will only cause them to give up altogether. Ah, well, there’s always Mexico; the border is just a few short miles from Chula Vista. They’ll be happy to fill our orders for pets. HSUS revealed in a press release yesterday that they have partnered up with some naive AKC breeders to form a Dog Breeder's Advisory and Resource Council. Hmm....the D-BARC. Rest assured, that name and its acronym are no coincidence! This is a blatant attempt to silence the voice of those who are independent thinkers. It's a typical divide-and-conquer ploy by experts in that tactic. "The new partnership will help consumers shop wisely for a puppy by recognizing the difference between responsible breeders and puppy mills." the announcement states. "...composed of responsible dog breeders from across the country. Council members will advise HSUS on dog health and welfare issues, and talk to the general public about what constitutes proper breeding practices, promoting the health of the parents and the puppies." Proper breeding practices according to WHO? 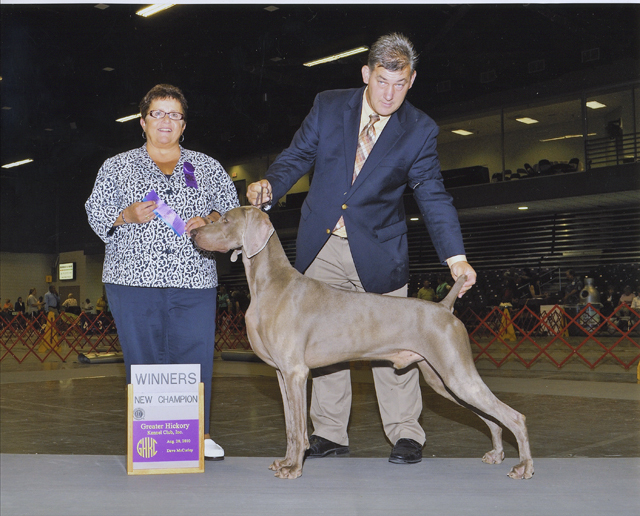 While certain "hobby breeders" may believe that championships and adherence to a breed standard are the most important criteria for success and prerequisites for breeding, others may have different priorities. They may wish to produce nice companions, good workers, or perhaps just would like to experience the joy of raising a litter of puppies. Nothing wrong with that! "We want to protect our right to be responsible breeders and to enjoy and bond with our dogs in show and performance events, but if we think for one minute that ignoring the problem of cruelty to animals makes us responsible breeders and protects our rights, I believe we're wrong," says Council member and AKC Breeder of Merit, Kathryn McGriff. "We can no longer sweep puppy mills under the rug." Apparently, this gal believes that breeding dogs=cruelty="puppy mill". Unless done her way. After all, she is lauded as an AKC "Breeder of Merit". A title signifying that the breeder registers all their dogs with AKC, and does some breed-specific health testing. This group of meritorious breeders is certainly not inherently more worthy than any other group of breeders. McGriff breeds Clumber Spaniels, a breed so rare that it is threatened with extinction. But soon, if HSUS and these "responsible" breeders have their way, laws will be crafted to demand that all breeders fit a certain, limited mold. It will be their way, or the highway. HSUS will use this D-BARC panel to try to eliminate any breeders who are independent thinkers, or who dare to wish to make a profit. And where does McGriff come up with the ridiculous notion that anyone is sweeping the issue of substandard breeders under the rug? Has she read the APHIS rules? The many "puppy mill" campaigns in the popular press? There are umpteen rules and regulations, both federal and local, that delineate humane care and treatment of dogs. If people are not complying with rules for care of their dogs then they can be fined, or, in some extreme cases, even have their dogs "rescued" from the situation. PLENTY of laws exist already on the books. Substandard breeders are exposed every day, and they either reform their practices or they are put out of business. The current system is working quite handily, and it is the finest system in existence. We certainly do not lack sufficient guidelines or laws when it comes to taking care of our animals. Heck, we have plenty of nosy bureaucrats interested in controlling our every step! And now, these few foolish Breeders of Merit are inviting yet more regulatory shackles upon all of us through participation in a program that seeks to "advise" the public on a narrow view of breeding practices. How dare they place all breeders in jeopardy! "The primary aim of The HSUS is to promote pet adoption from shelters and rescue groups, and encourage consumers who choose to purchase a puppy to buy from a responsible breeder instead of inhumane, commercial breeding facilities known as puppy mills." the press release continues. According to HSUS president, Wayne Pacelle, "We commend the responsible breeders who are showing leadership in their community and speaking out against the abusive operations that treat dogs not like loving family members, but like a cash crop." DOGS ARE NOT PEOPLE. They are not equivalent to a family member, unless the owner CHOOSES to treat them as such. Many dogs are bred for work, for hunting, for protection, for guides to the blind and other service. While many dogs are also bred as companions, every one of the aforementioned purposes is just fine too. There is absolutely nothing wrong with breeding dogs as a business. Gosh, how I wish I could make a living doing what I love, being around my dogs 24/7. But alas, that is not possible for those who breed only on a small scale. And now those who breed as a business are under direct attack from all fronts. The HSUS puts the emphasis on "adoption" from shelters and "rescue" groups. Never mind the fact that shelters and rescues often import dogs from other areas and even other countries because they don't have enough dogs available for sale. Today I also received word about another show breeder who has fallen under the spell of the HSUS. Just read her note from a message board on the HSUS's website! What can we reasonably expect from a ditzy chick who can't even spell "conformation"? And who thinks you can judge health in a show ring? Absolutely moronic. Where has she been all these many months that breeders have been under attack? She must be quite insulated from reality there in the Hawaiian islands. If there are more like her, no wonder we read this week that the State of Hawaii is now proposing a law requiring every dog sold be sterilized. * That has HSUS written all over it. Pet extinction in paradise. Are these few sanctimonious and pious show breeders partnering up with HSUS in a pathetic attempt to eliminate the competition? Or are they really that clueless about the HSUS? Sadly, some AKC "Breeders of Merit" have joined the circular firing squad. There is nothing meritorious about attempting to eliminate the rights of others to participate in breeding programs that comply with government regulations for humane care and treatment. 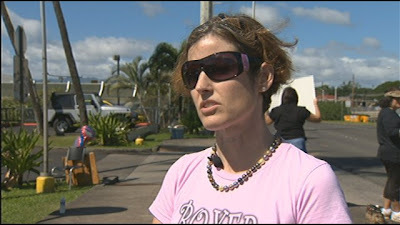 Theresa Donnelly, Boxer Club secretary, at a pet store protest in Hawaii on Jan 28, 2012. Wake up and smell the coffee, Toots!